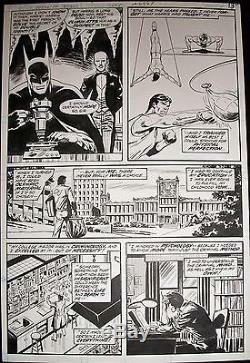 Offered here is an incredible RARE opportunity to own an ORIGINAL COMIC ART page out of "The Untold Legend Of Batman" circa 1980. This page comes out of the key book which showcased JOHN BYRNE'S " very 1st" work ever for DC comics, and his very first work penciling BATMAN. It wouldn't be until 6 years later that John would return to DC comics to begin his classic revamping on their flagship character; Superman in the memorable "Man Of Steel" mini-series. And if this wasn't enough, the inking chores here were done by none other than the great JIM APARO. 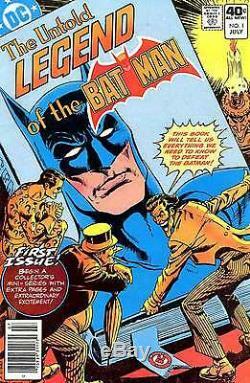 Jim has been ranked within the top 7 greatest Batman artists who had ever worked on the character. The art itself recounts part of Batman's origin story, with a picture perfect knockout first panel which displays both The Batman "and" his faithful servant; Alfred Pennyworth. The page is in excellent condition & comes from a smoke-free home. This original art page shall be sent out FLAT, STURDY, & HARM FREE. The cover presented here is only a scan simply to show what book this marvelous art was created for. Anyway, don't let this fantastic opportunity pass you by in owning a big part of superhero comic history. The item "UNTOLD LEGEND OF BATMAN ORIGINAL ART/ HISTORIC JOHN BYRNE 1ST DC /BATMAN 1980" is in sale since Thursday, November 24, 2016. This item is in the category "Collectibles\Comics\Original Comic Art\Other Original Comic Art". The seller is "rockin_art" and is located in Henderson, Nevada.